It's clear now that the NCAA uses public opinion as its final appeals process. It ruled former marine Steven Rhodes ineligible to play football at Middle Tennessee State because he had played in a military rec league. It ruled Colgate basketball player Nathan Harries ineligible because he had played church league hoops. Both times it reversed its stance after a public outcry. Let's see if we can't get BYU runner Jared Ward reinstated. 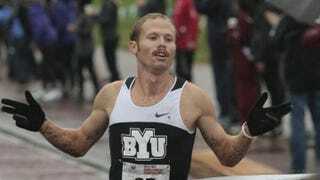 The Deseret News delves into the story of Ward, a cross-country and track runner who's been an All-American four times, but is being forced by the NCAA to sit out his senior season because he took part in a fun run four years ago. Ward returned from LDS missionary work in September of 2009, but missed the cutoff to enroll at BYU for the fall semester by a few weeks. He decided to spend the next three months training to regain his fitness after two years of inactivity before he enrolled for winter semester. That fall, he traveled to California to watch his younger brother compete in a regional cross-country race. Just for the fun, as a prelude to the real race, there was a recreational race for coaches, parents and other supporters of the athletes. It is a just-for-fun event whose entrants range from teens to 70-year-olds. The race is so lighthearted that some of the entrants wear costumes. "I had to get in a workout that day anyway, so I thought I'd just jump in the race," Ward says. "A lot of the entrants try to get a laugh out of the kids, so they wear costumes. I recall someone wearing a tuxedo and another guy in a bird suit and a monkey or gorilla costume." The NCAA ruled that the race was officially an organized competition, and that it provided him a competitive advantage over other runners before beginning school. Again, there was someone wearing a gorilla costume. "If I were trying to gain an advantage by running in a competitive race," Ward said, "I wouldn't have chosen that race. It's not a competitive effort." What's particularly galling is that taking part in the race would have been completely acceptable had it been within a year of Ward's high school graduation. It wasn't, because of his two years doing mission work for the church. The NCAA docked Ward an entire season of eligibility. Ward chose to run as a freshman, because he was sure the NCAA would see the light and overturn his ban. But two BYU appeals were rejected and now Ward, one of the best runners in the country (he finished 10th in the NCAA 10K championships last year), isn't allowed to compete in what should be his fourth season. His college career is effectively over unless the NCAA changes its mind. So make a stink. Clog up Mark Emmert's inbox. If a public shaming is the only way to get this organization to pay attention, then a public shaming it'll have to be.